A qualified Collaborative financial neutral will have significant mediation training and experience as well as training and experience as the financial neutral in the Collaborative divorce process. In practice, financial neutrals tend to be either Certified Public Accountants with business valuation and forensic accounting experience or Certified Financial Planners with special training as Certified Divorce Financial Analysts. Each type of financial neutral offers a distinct skillset which you and your spouse should compare against the complexities of your marital estate. It is helpful to the Collaborative process if, in addition to financial expertise, your financial neutral has a strong background in mediation. 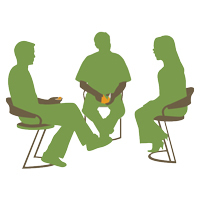 A mediator’s skillset resonates well with the Collaborative divorce process and includes active listening skills, questioning and clarifying skills, emotional intelligence so as to truly understand underlying emotions, empathic skills to help you and your spouse to stand in each other’s shoes and understand each other’s point of view, reframing skills to dilute emotionally charged language, summary skills to clarify and articulate the many points of your agreement and not just your points of conflict and a strong communication skillset to explain complicated and confusing financial concepts in plain English. Typically, your financial neutral will gather and organize your financial information avoiding the duplication of efforts found in litigation and ensure that you, your spouse and the Collaborative professional team all receive the same financial documents throughout the Collaborative process. Transparency is critical to the Collaborative process and the financial neutral will help you identify missing financial information and overlooked assets and debts. Your financial neutral will also work with both of you to create personal budgets and cash flow analyses for your lives post-divorce. For some people, this may be the first time working through a comprehensive financial planning process. It is sometimes eye-opening to realize that both of you may have to change your future life styles knowing that the same level of income must now support two separate households. Reconstructing your historical expenses is usually not necessary because your post-divorce future will probably differ significantly for your past. Difficult decisions often must be made and your financial neutral will try to suggest ways in a non-confrontational manner to improve your future cash flows. In many families, one spouse has traditionally performed the basic financial jobs such as paying the bills, reconciling the bank accounts and shopping for food. Your financial neutral will provide significant guidance to the spouse who is not as experienced dealing with financial issues and produce a financial asset and debt report that includes the current after-tax value of all of your assets and debts. As with the budgets, many have no idea of their true “net worth” (assets less debts). Many couples have indicated they had no idea they were worth so much; but as many have also indicated they didn’t realize they were worth so little. The financial asset and debt report is the foundational document used when discussing property division alternatives and your financial neutral will help you and your spouse clarify and articulate your initial preferences as to property division prior to subsequent 6-way meetings where the Collaborative team will help you to address and resolve any conflicts keeping you from agreement. Different property division scenarios will be presented by the financial neutral for discussion. We financial neutrals can also shed light on the tax and cash flow implications of various scenarios. The possible sale of the marital residence and valuation of retirement assets and stock options are often major financial discussion topics. And in more complex cases, your financial neutral may need to trace some of your assets and debt to support classification of marital versus separate property. An experienced financial neutral will often offer financial guidance to you, your spouse and your Collaborative attorneys who will weigh in on the legal definition of separate versus marital property in the 6-way meetings. Your financial neutral is usually asked to prepare various child and spousal support calculations based on different scenarios. These calculations are presented so that the maximum after-tax cash is available for both you and your spouse. Other complex situations may require the financial neutral to essentially facilitate a neutral business valuation of an ownership interest in one or more privately-held businesses. The use of your financial neutral on the Collaborative team will help you and your spouse make informed financial decisions throughout the Collaborative process. We can help provide you and the Collaborative team critical information about various financial alternatives. Your financial neutral will participate in 6-way meetings with you, your spouse, your neutral coach and your Collaborative attorneys and lead the discussion of the financial issues. The ultimate decisions as to which financial alternative is chosen, however, belongs to you and your spouse. This Collaborative divorce approach offers the opportunity to create a financial settlement that meets the interests of both you and your spouse without resorting to the adversarial and positional bargaining techniques that characterize litigation. Your financial neutral is an integral part of the Collaborative divorce process. Our role as non-biased financial educators help you and your spouse make informed financial decisions and plan for the next phase of your lives. I am the managing partner of Blythe Paperless, Certified Public Accountant. I have practiced in greater Kansas City since 1977 and developed core competencies in financial divorce mediation and Collaboration, forensic accounting support in litigation, financial statement assurance services including audits, accounting and information system internal control assessment, tax planning and compliance, cash management and distressed company turnarounds, business planning. I also own Financial Divorce Bay Area and Divorce Financial Kansas City, both financial mediation firms that focus on resolving marital disputes with mediation and Collaboration to provide a safe container supporting respectful, affordable and equitable divorce solutions. I have been profiled by the American Institute of Certified Public Accountants as an accounting pathfinder in its CPA Vision project. I am a licensed Certified Public Accountant, a financial mediator and a Microsoft Certified Systems Engineer (MCSE) Windows 2000 with a Masters in Business Administration and a BS in Journalism from the University of Kansas. My interests include meditation and Japanese watergardening.